The summer reading program at your library is a unique time when you have the attention of kids – and their parents. As your SRP comes to a close, why not use it as a platform to promote success in school? As you know, earlier this year the State Library launched the availability of Brainfuse – an online tutoring and job help portal. It is free for all New Mexicans to use. 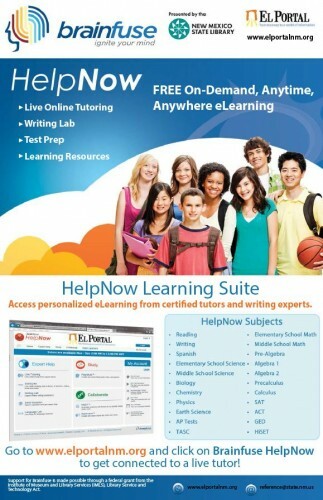 Homework help: Students can submit a question and a tutor will respond within 24 hours AND connect with a live tutor in a chat room to work through homework questions. Tutors don’t simply give answers but help students master underlying academic concepts. They may solve a similar problem for the student to show HOW to do something, but will not give answers outright. Study tools: Students can make flashcards, coordinate an online study group, and build their skills with SkillSurfer. It even has state-aligned live skills building! Writing center: Students can share drafts of essays with live tutors who will help with organization and development of ideas. With intensive writing analysis, students can submit their paper and a tutor will review each paper for word choice, content, sentence fluency, and organization. Papers are returned within 24 hours. With all of this FREE support from Brainfuse’s qualified tutors, why not spread the word to your summer reading patrons? Brainfuse is an asset to all levels of learning, from Kindergarten to adult! Spread the word by distributing this flyer to your patrons – and get them connected to Brainfuse today! For more promotional tools, click here. Promote Brainfuse in your library!